Who's the West's Next Coffee Champ? Who’s the West’s Next Coffee Champ? Last year's champ, barista Jared Truby (photo courtesy of Verve). Serious coffee hounds are making a beeline for downtown Santa Cruz this weekend to watch the West’s best baristas battle it out in the 2013 Southwest Regional Barista Competition. 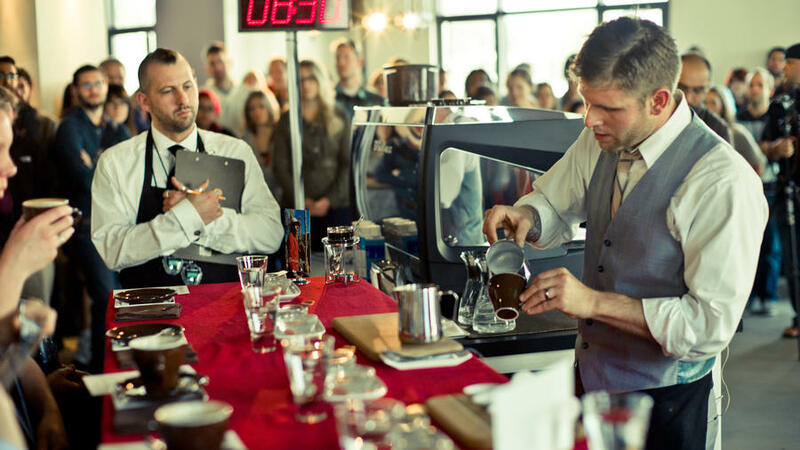 Last year’s champ, barista Jared Truby (photo courtesy of Verve). Serious coffee hounds are making a beeline for downtown Santa Cruz this weekend to watch the West’s best baristas battle it out in the 2013 Southwest Regional Barista Competition. Hosted by Verve Coffee Roasters, the three-day extravaganza highlights our favorite baristas—like Casey Solorai from Intelligentsia and Sergio Arreola from Ritual—in all their foam-making, shot-pulling glory. Verve’s own Jared Truby was last year’s champ. But this is no simple cappuccino-making competition. Jared won with a serious, molecular concoction: Espresso mixed with molasses tea, and served alongside Spro (coffee) foam and a sphere containing cherry, apple, and pear juices. Jared won’t be competing this year to defend his title, though fellow Verve baristas Jasper Wilde and Stacey Kock are stepping up to the steam wand. The first round starts today and the finals are on Sunday, March 17th. Can’t make it? Watch the live stream, or follow Verve as they live-tweet the competition.